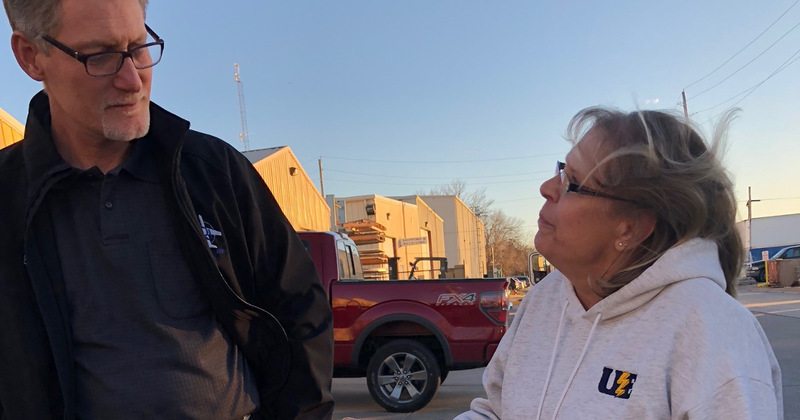 A UE delegation delivered a message to a Kansas company that has locked out 32 workers at D-J Composites in a small Canadian town. UE delivered flyers last week to the headquarters of D-J Composites, which owns the Newfoundland facility where aerospace workers, members of Unifor Local 597, were forced out of work and locked out a year ago, on December 19, 2016. “We are thankful to our union brothers and sisters at UE for their solidarity expressed thousands of kilometers away, showing this American employer that worker unity knows no borders,” said Lana Payne, Unifor's Atlantic Regional Director. The UE delegation was unable to speak to company owner Rezaul Chowdhury, but they did tell Ray Tuschhoff, Vice President of D-J Engineering to return to the bargaining table and get Canadian workers back to work. The company then called police to remove the UE delegation, even though they were just handing out flyers to raise awareness of the fact that D-J Composites had been convicted of bad faith bargaining by the Newfoundland and Labrador Labour Board, which is a violation of provincial employment law. The locked out workers were delighted to hear that union members across the border were standing up for them, 4500 kilometers away. From the beginning of this lockout the employer had one goal in mind - to break the union, Unifor, and stop resistance to concessionary and two-tier bargaining that divides workers, but with the support of UE members and strength of Unifor that will not happen. To learn more about the lock-out please visit unifor.org/supportlocal597.